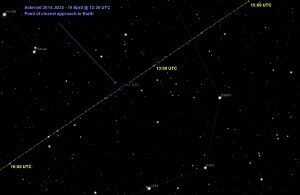 Discovered by the Catalina Sky Survey as part of NASA’s NEO (Near Earth Object) observations program back in May 2014, asteroid 2014 JO25 measures 650 meters in diameter. On April 19, 2017 the massive space rock will pass within 1.1 million miles of the Earth. It sounds far but for an object this size it’s a reasonably close (but safe) shave. Although many smaller asteroids routinely pass the Earth at a distance much closer, this will be the closest pass of an object of this size since 500 meter asteroid 2004 BL86 passed the Earth on January 26, 2004 at an even closer distance of 745,000 miles. In September of the same year another large asteroid (4179 Toutatis) passed slightly further away at 4 lunar distances from the Earth but that regular visitor to the Earth-Moon system is a whopping 4.9km (3.1mi) in length! 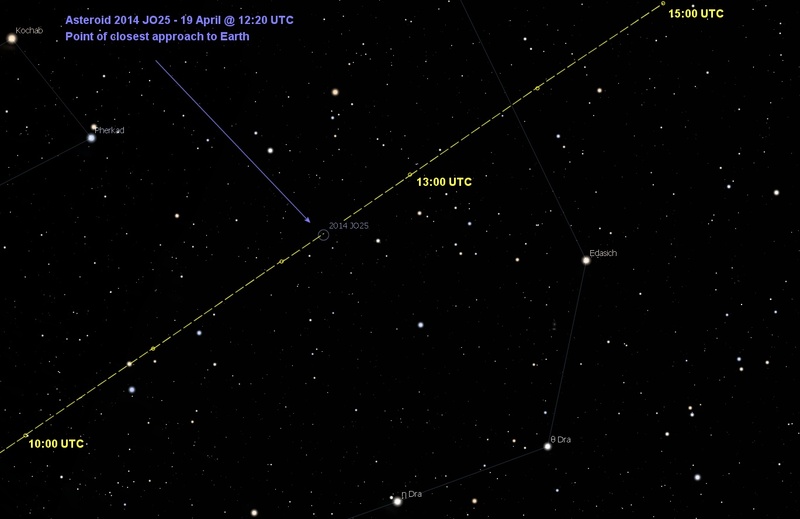 Asteroid 2014 JO25 is expected to reach an apparent magnitude of 11 or 10, which should put it in the observable range of 8 inch telescopes or larger. 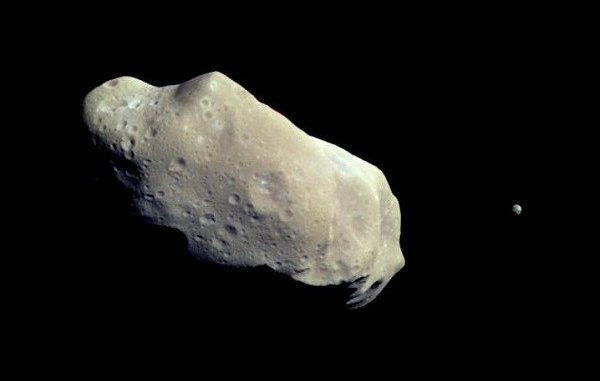 For this particular asteroid, it will be the closest encounter with the Earth for at least 400 years and the asteroid won’t get this close for another 500 years. 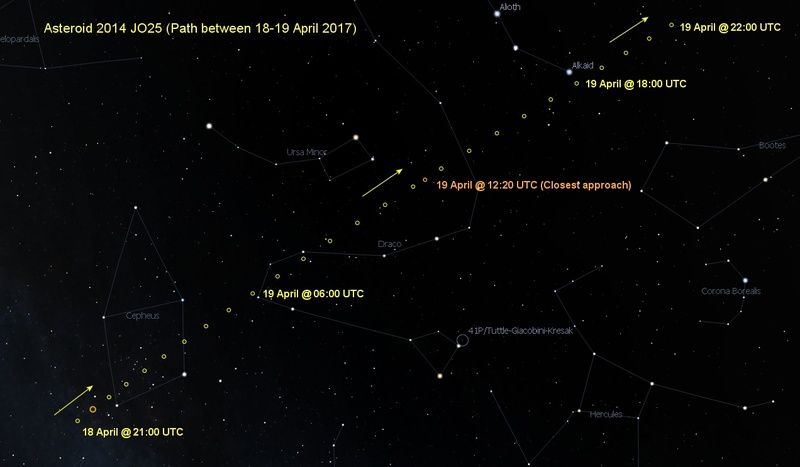 On the night of the 19th, the massive piece of rock will reside in the constellation of Draco heading towards Ursa Major. 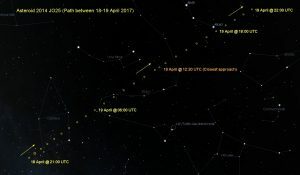 Absolute closest approach occurs at 12:20 (pm) UTC which favours observers in the far East and Australia where it will be dark, however the asteroid can be viewed on the night of the 18-19 April from Europe and the Americas at night time where the asteroid will still be within 1.2 and 1.6 million miles distant sweeping through the constellation of Cepheus towards Draco. 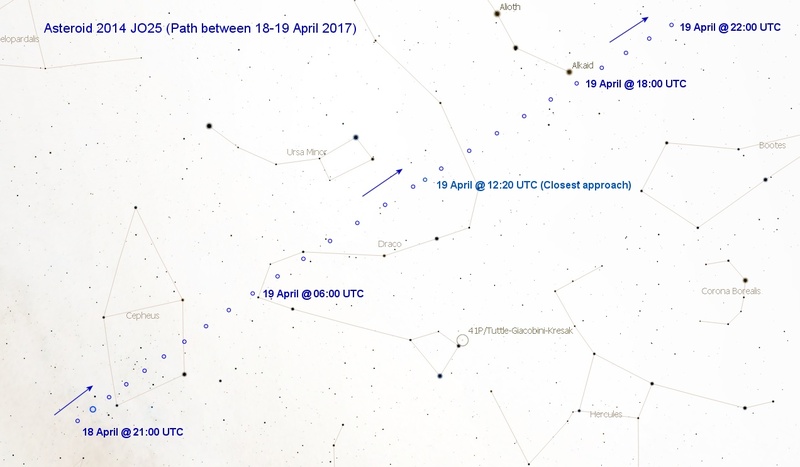 See the finder charts below taking note of the times in UTC and convert to your local time. 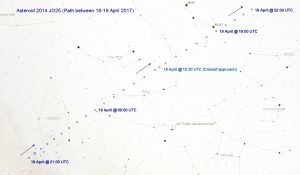 The next large asteroid pass will not be until August 2027 when half-mile wide 1999 AN10 approaches within one lunar distance (236,000 mi) of our planet reaching an estimated magnitude of 7.3 as viewed from the Earth.